Basic information about a property. Generally includes: property status (for sale, foreclosure, reo); owner and vesting; legal description (partial or full, as available), parcel number; last sale (NO sales history); basic property, land and tax data (NO boundary information). Available information varies. List of recorded transactions for a property. Provides document details, such as recording date, party names, loan amount, and document recording number. History report is recent, often for the last 10-20 years, and varies by area and property. Includes Property Detail Report (see above). Documents not included. Copy of the most recent transfer document (grant, warranty, or quitclaim deed) for a property. Note that a deed of trust is NOT a transfer document; please request as finance document (see below). Includes Property Detail Report. For documents other than last recorded one, provide specific details. Copy of the most recent finance document recorded for a property. Usually a deed of trust or mortgage. List of recorded documents for a property (property index). Also transactions posted to the owner (general name index). Contains involuntary liens (bankruptcy, tax or mechanic's lien). Documents included as provided by county. Not available in all areas. What is a real estate title search? Does the seller or grantor have an interest in the property being transferred? Are there any restrictions pertaining to the use of the land (real covenants, easements, or other servitudes)? Is the property encumbered (mortgages, back taxes, mechanic's liens, or other assessments)? Anyone can do a title search. Recorded documents concerning conveyances of land are a matter of public record. These documents are maintained in hard copy format or scanned into image files by the recording office in the jurisdiction where the subject property is located. Each record is a document evidencing an event that occurred in the history of the property. When combined, these records create a chain of title for a specific piece of property. Performing a title search involves accessing the official land records provided by the county or jurisdiction. Who should get a title search? Anyone who receives real estate, whether it is a purchase or a gift, is well advised to complete a title search for that property. When purchasing real estate, a title search protects the buyer. Not only does it confirm the actual ownership status of the seller, but it also verifies the seller's statements about the quality of the title and encumbrances on the property. When receiving real estate as a gift, a title search is also in the recipient’s best interest. Real estate can carry burdens that may turn a gift into a nightmare. Get a copy of your deed today. 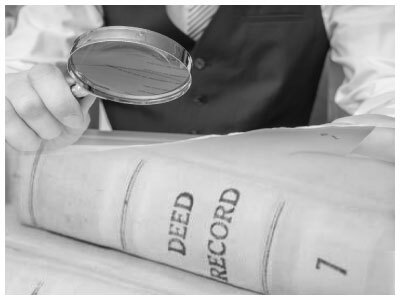 Use our deed retrieval service to get a digital copy of your real estate deed today. We can pull the most recent transfer document (deed) for most properties within minutes.